Book Your Pretty Wedding Shoe Appointment Now! We have created The Pretty Wedding Shoe Company Experience because we know planning a wedding can be stressful and tiring and it is really nice to have some things to do that are fun and make you feel special. When you book your Pretty Wedding Shoe Company Appointment – you can be assured of a warm welcome and I will guide you through finding the perfect wedding shoes for you and your bridesmaids in a relaxed environment. You can even bring a friend or two and make it an enjoyable part of your wedding planning over a glass of Prosecco. You will find your Pretty Wedding Shoe Company Experience the totally opposite to the following true story of when we went to buy my daughters dress. We didn’t get a warm welcome, just a grunt and weren’t even offered a drink. We weren’t allowed to use their bathroom and had to walk to a nearby shopping centre to use their facilities! This ate into the one hour slot we had been allocated, so the next bride was waiting and it just felt stressful and hurried. Not good at all. She did however find The Dress, so that was good although, we would have rather have spent our hard earned money at Anna McDonald Bridal Gallery or Butterfly Bridal Boutique, but we hadn’t met them then! Prior to painting your shoes, I like to get to know you a bit. 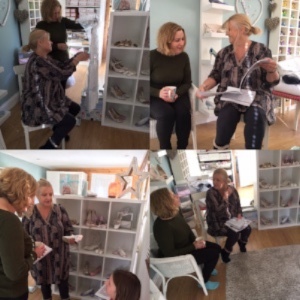 It’s lovely be able to discuss your ideas during an appointment at The Pretty Wedding Shoe Company Studio (we are located between Thame and Aylesbury near the Buckinghamshire / Oxfordshire border ) or if you are too far away we can do this through email and Skype. I encourage you to bring any bits and bobs with you that will help convey what you want. This can include material swatches, photos, magazine clippings, a postcard of a special place, links to a Pinterest board etc. We will complete a simple questionnaire so I can grasp as much as I can about what you’re looking for. Don’t worry if you don’t have any firm ideas, I can guide you through the process. I’ll then spend time looking into what we’ve discussed and reviewing your ideas before putting together a sample design hand painted onto satin, that really grasps the key look and feel you are after. The design can then be tweaked before being signed off and I hand paint your shoes. 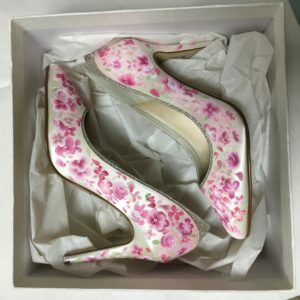 Wedding Shoes, Mother of the Bride Shoes and Adult Bridesmaid Shoes: A one stop shop where we can sort out all your wedding shoe needs, in a beautiful relaxed setting. No more traipsing from shop to shop – we have a fantastic range of Rainbow Club Shoes in a variety of styles and sizes for you to try including heels, strappy, kitten heel, vintage and flats. 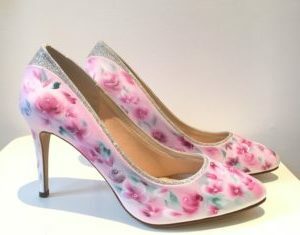 You are welcome to purchase shoes from us and not have them hand painted, if that’s not your thing! 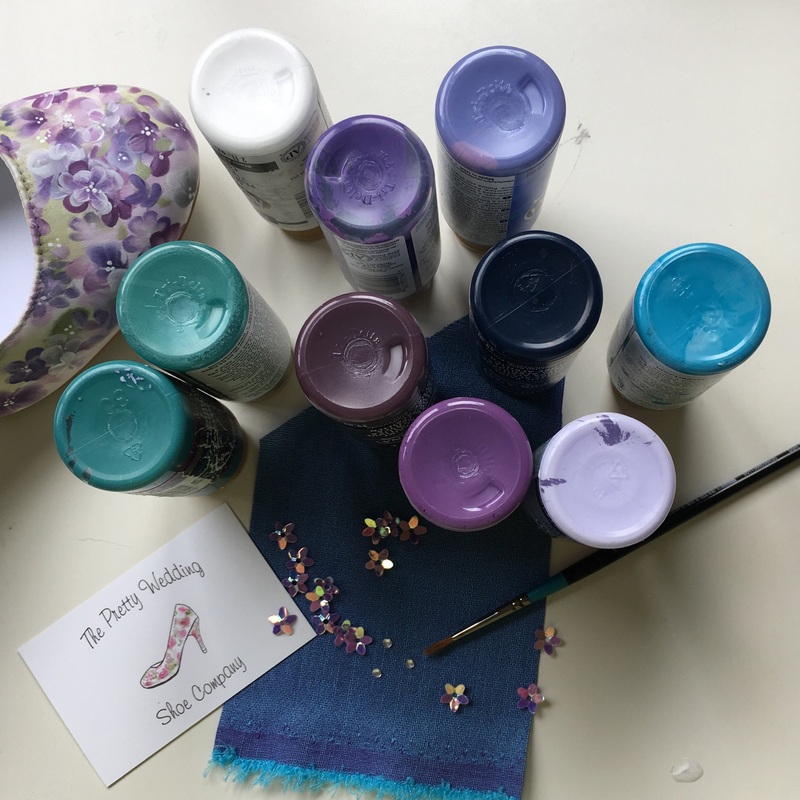 Hand Painting of Shoes To Make Them Personal To You: This is where The Pretty Wedding Shoe Company really comes in to it own! We can help you bring your vision to life. You can bring any designs, pictures, swatches even a mood board to get the process started and together we will create your dream shoes. You can read more about it here or view some ideas in our Gallery. 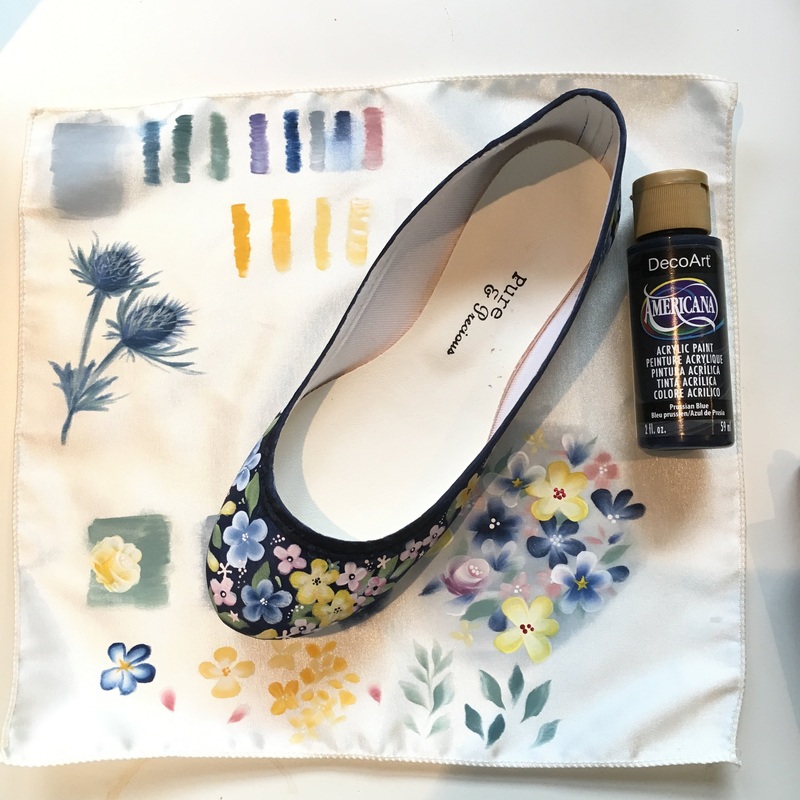 Shoes: You can bring your own satin shoes to have painted, that you have bought elsewhere. This is totally ok and we won’t make you feel awkward for not buying from us! Children’s Bridesmaid Shoes: We have a lovely range of Children’s Bridesmaid and Flower girl shoes and we can help you get the right size. Wedding Accessories: We stock a range of ties, bow ties, pocket squares and bags, which can all be hand painted to match your theme and colours. Light refreshments for you and your party and use of the bathroom! 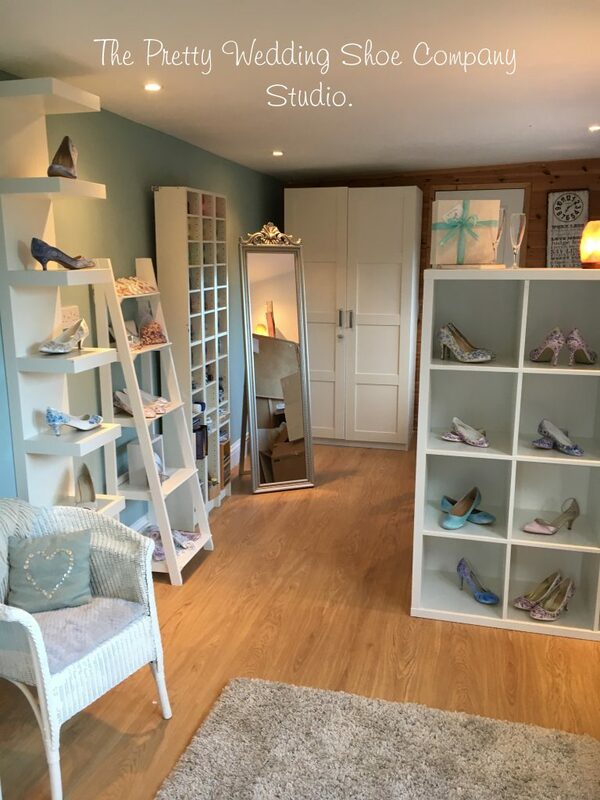 A warm welcome awaits you at The Pretty Wedding Shoe Company. If you would like to come and see our shoes or talk about your custom design we would love to see you. Please email and we can make an appointment. Please do not just turn up as I don’t work regular 9 – 5 hours! Book Your Pretty Wedding Shoe Appointment Here!